There are many flowers for a new baby, and to congratulate the tired but happy Mom. But what flowers to give for a new baby? What color should you send the baby bouquet, and what flowers should it include to send the right message? Read on, and don’t forget to check out our By Month category to learn more about new baby flowers and birth month flowers too. Blue is the traditional color to celebrate the arrival of a boy, and we suggest going for a mixed bouquet of big and bold blue blooms. Big and bold steers us to Hydrangeas. Or for a bold shape, consider blue lilies. Dress your arrangement up with a bright, bold ribbon and add similar white blooms to mix it up a bit, and to symbolize the innocence of the new life. Pink for a girl, and delicate, sweet blooms are best. Budding roses about to emerge into the world, lilies, pink stock, carnations, or tulips. 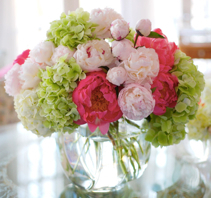 These light soft pastel colors symbolize innocence and joy, and with white blooms adds that expression of innocence. Of course, if you’re sending flowers before the birth, a mixed bouquet of pink, blue and yellow, and white, celebrates without predicting the gender, and sends a perfect message to the Mom-to-be; that you’re thinking of her during this wonderful event. Our favorite online florist sells some beautiful new baby flowers, and offers same day delivery in the US and Canada. They also offer keepsake gifts and balloons to celebrate the arrival of the new baby.